Just wanted to take a moment and say WOW. HAPPY NEW YEAR! IT IS 2015! That means… 2005 - 2015 = Decade I of NOTCOT done! 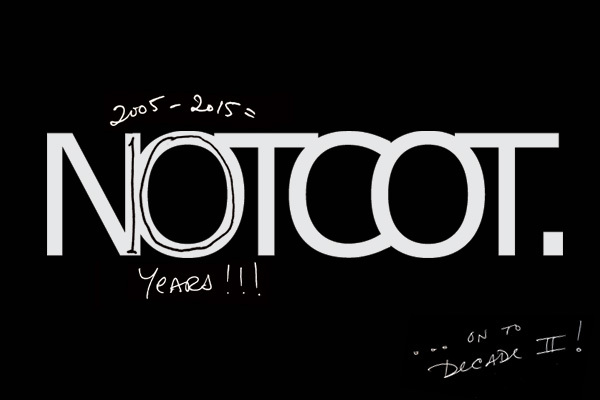 We are now heading into NOTCOT: Decade II… crazy! I’m excited to jump into 2015 as more of a fresh start to see what we can do with Decade II rather than look back, but before i do that - i must admit that the act of finding at least one thing EVERY DAY that inspired/excited/amused me has been truly life changing. NOTCOT is definitely my happy place! A lot has happened the last 10 years, and i can not imagine a more exploratory and fulfilling way to have spent my 20s - the things i have learned, seen, played with… the people i’ve met… the places i’ve been… what a ride! I wouldn’t trade it for the world. And as will any real life - there were the highs, lows, crazy times, but it has never been boring. So THANK YOU for coming along for the ride. If there’s one thing i’ve learned, it’s that “Do what you love, and the rest will figure itself out.” is definitely true! It feels freeing more than anything to embrace 10 years down… on to newness! I won’t stop sharing things that inspire me (i don’t know that i could if i wanted to) - but i will definitely be shaking things up a bit more, and at the moment it’s unclear whether that means all of it will be shared online, or even publicly… NOTlabs is growing, and if you want to play, collaborate, or brainstorm together, we should definitely chat! Congratulation, in the last 10 years, Notcot has always been one of the biggest inspiration source and one of the reason why I want to become a designer. In the last 10 years, the internet has also changed dramatically, endless scrolling, different screen sizes, mobiles and every other things. I still hope to see Notcot to have a big change of design that really fit the cool content inside, something really practical and shipped to users doorstep. Keep going! This is my favourite website online, hope to see it going straight into the next decade. Congrats. BIG FAN OF YOURS .. i dont start my day without going through your inspirational sites … Keep up the good work !! I’ve been following almost daily since 2005. Thanks for all the cool design links, blog entries, and inspiration. Congrats!! I’ve been following you from the start and you’ve been a limitless source of inspiration. Still are my go-to sites for design news and general happiness. So, thank you and here’s to the next 10! Congratulations - all of the notcot sites are great and super inspired. I love checking back everyday for what’s new. Thank you for making it all happen.